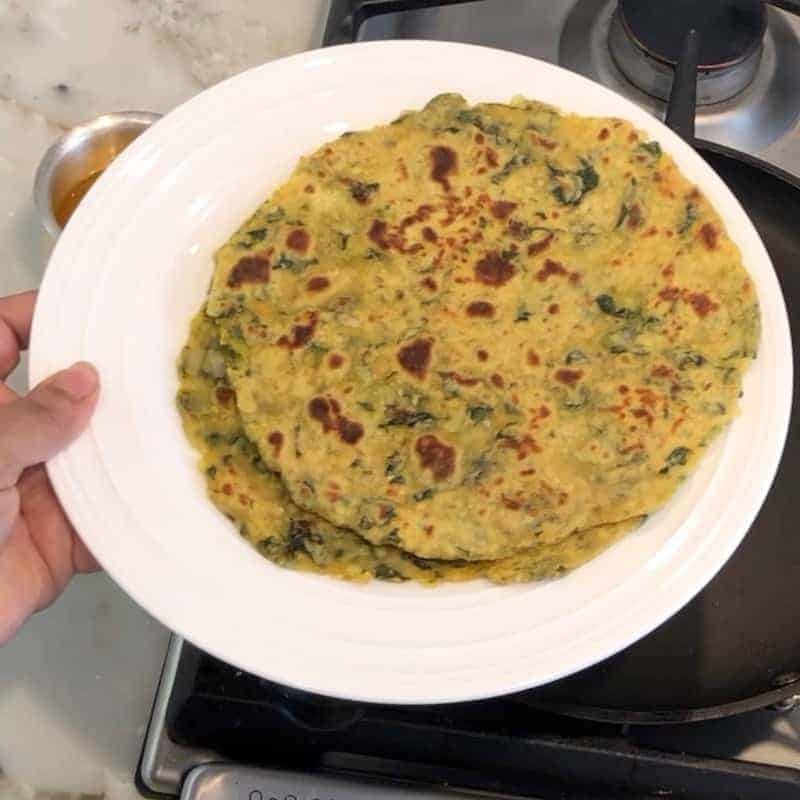 Kale Potato Parathas are flatbreads made with whole wheat flour kale, potatoes, green chilies, garlic and spices. 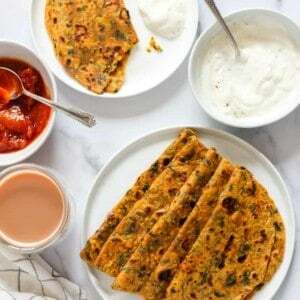 These tasty parathas can be enjoyed for breakfast, lunch or dinner. Note: The original recipe posted in Jun 2016 has been updated with detailed step by step photos and recipe video. I was introduced to Kale years ago when I first ate Kale chips. 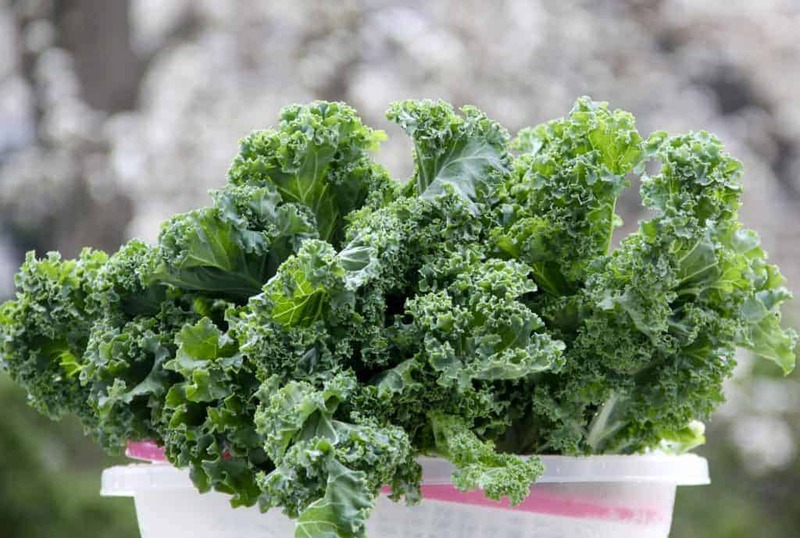 Since then I have come across several articles that helped me understand all the nutritional benefits of kale. 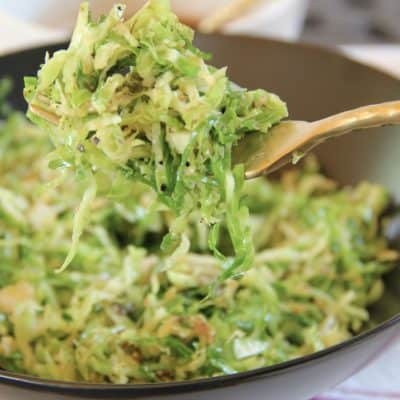 It is packed with vitamins, fiber and several dietary minerals. Given it is so readily available in stores, I tried it as chips, in salads and then slowly introduced it in my Indian cooking. 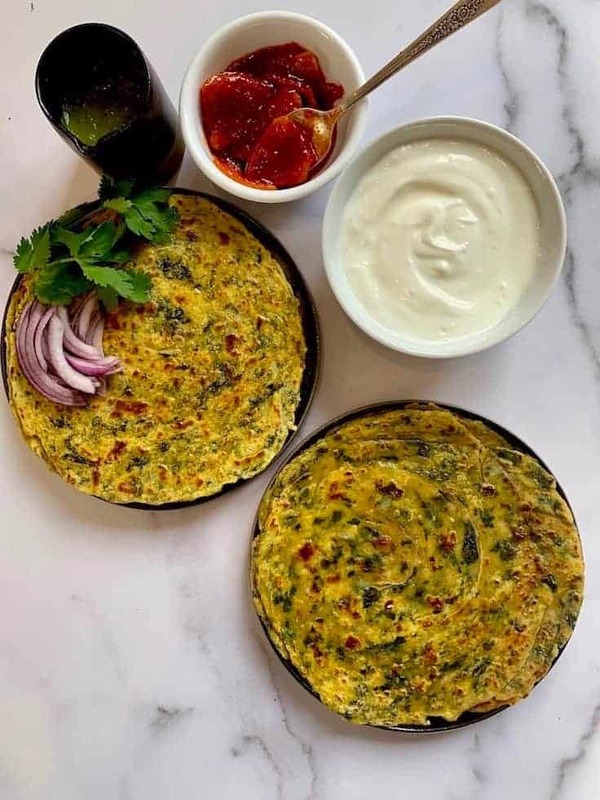 Parathas are usually made by rolling dough that is layered with oil and hot flour. Layering makes parathas soft and flaky. 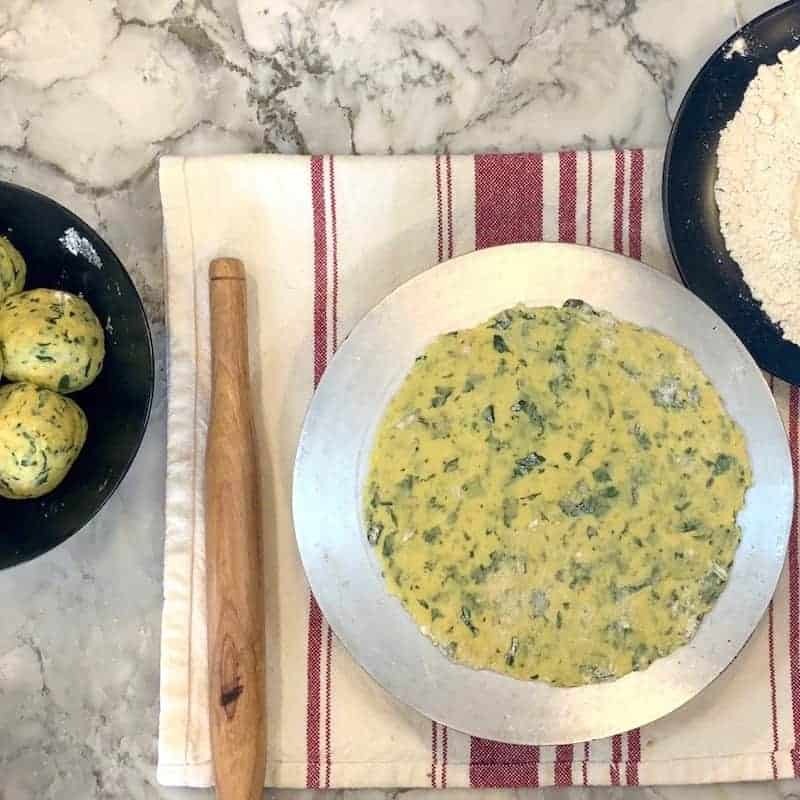 In this kale potato paratha recipe, I add steamed potato, that makes parathas soft and flaky which means you can eliminate the step of layering the dough. Steam a medium potato in the Instant Pot or on stove top. 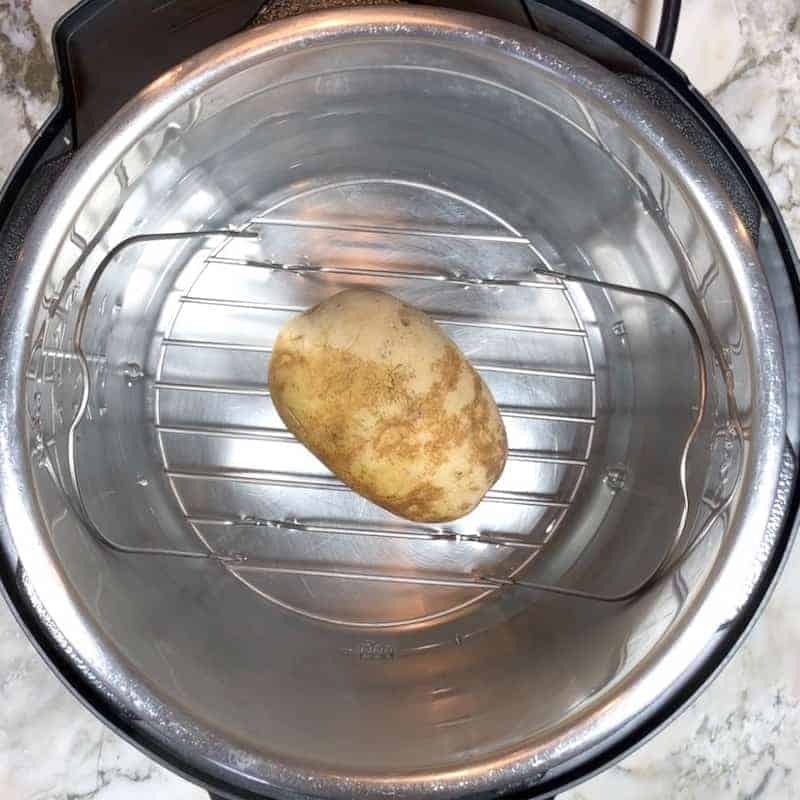 To steam the potato in the Instant Pot, place one cup of water in the Instant Pot insert. 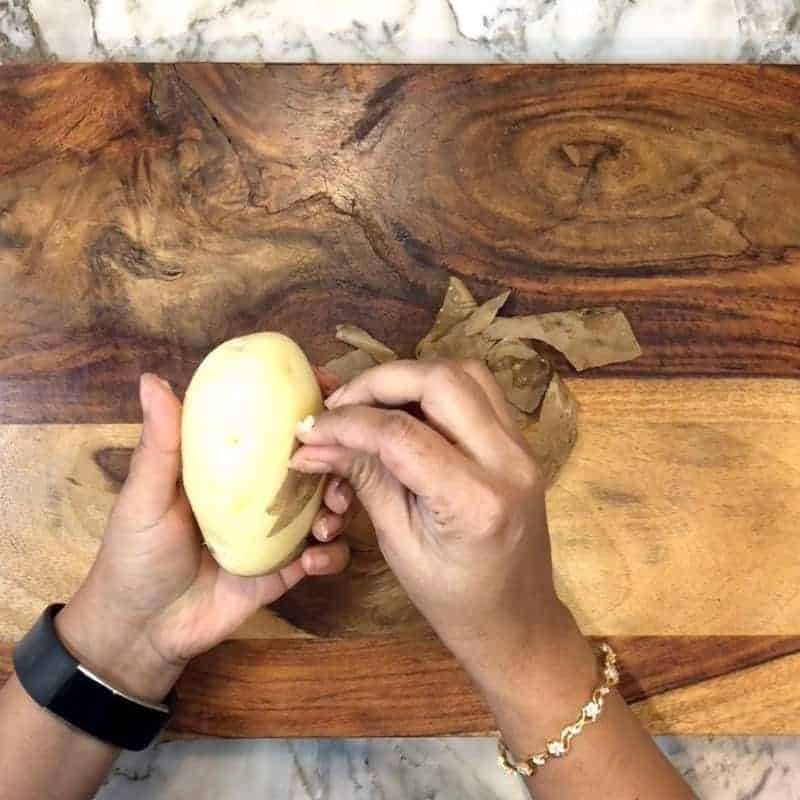 Place the trivet inside the Instant Pot and put the potato on top of the trivet. Close the lid and steam for 12 (medium potato) to 15(large) minutes followed by 10 minutes natural pressure release. Allow the potato to cool. Peel and grate the potato. De-stem the kale leaves. 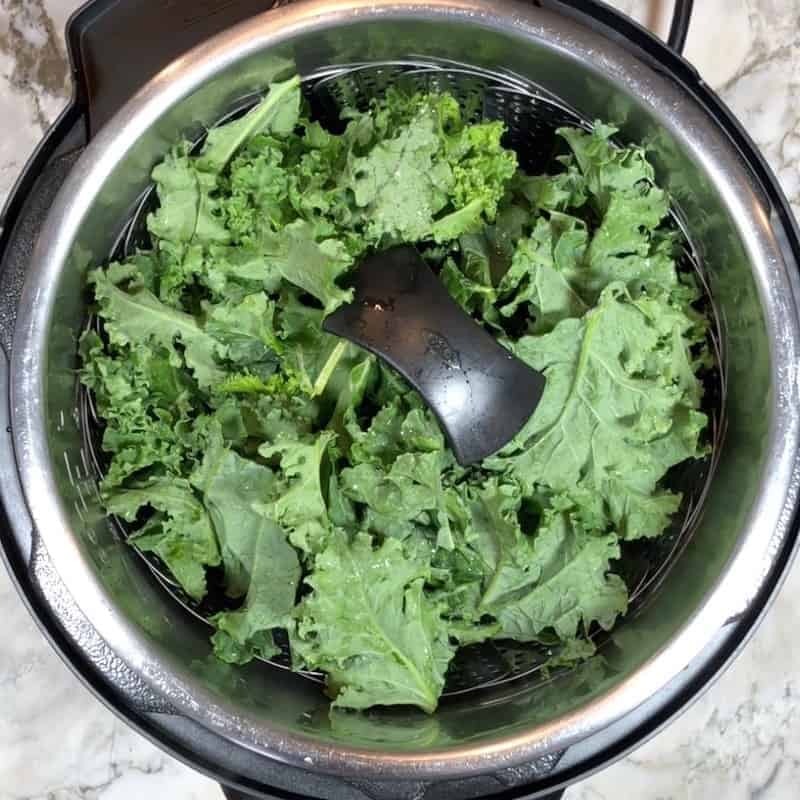 Steam kale leaves in hot boiling water. Or to steam in the Instant Pot, add 1 cup of water to teh Instant Pot insert. Place a steamer basket inside the Instant Pot. 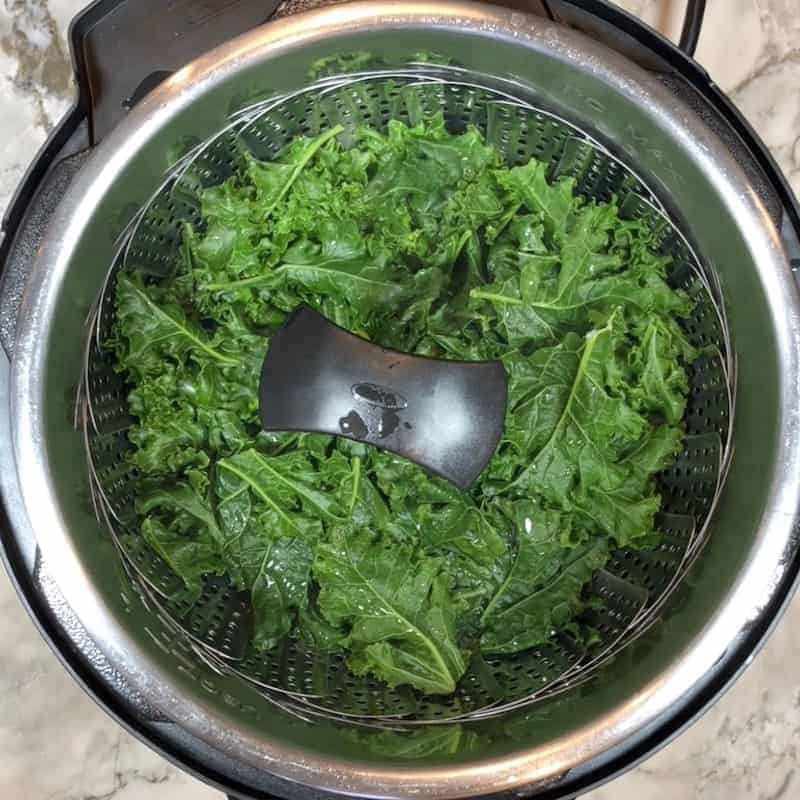 Arrange kale leaves in the steamer basket. Close the lid and steam for 1 minute followed by quick release. 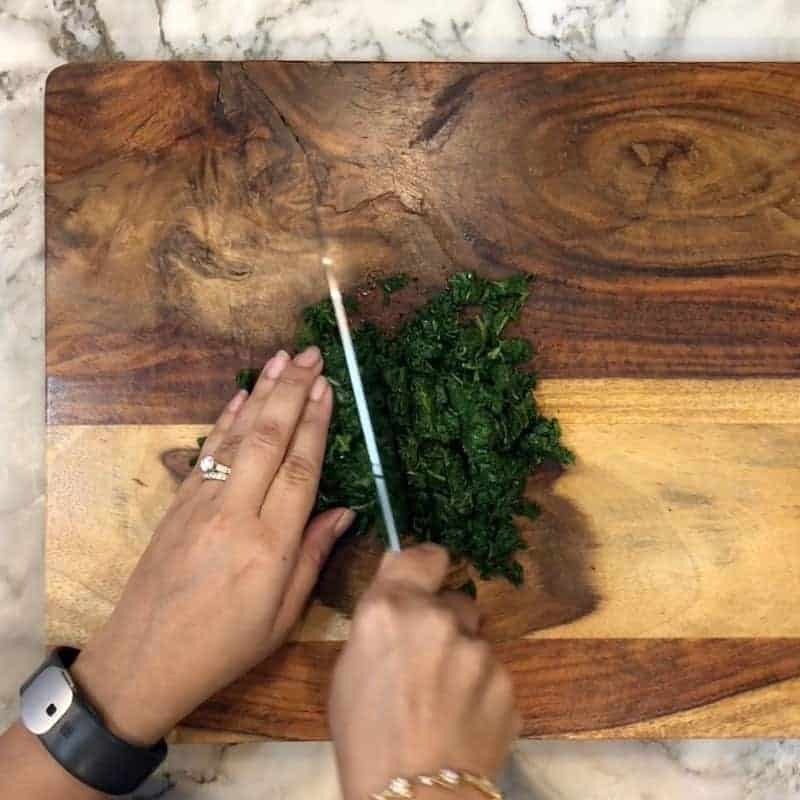 Allow the steamed kale to cool down, squeeze out all the water and chop finely. 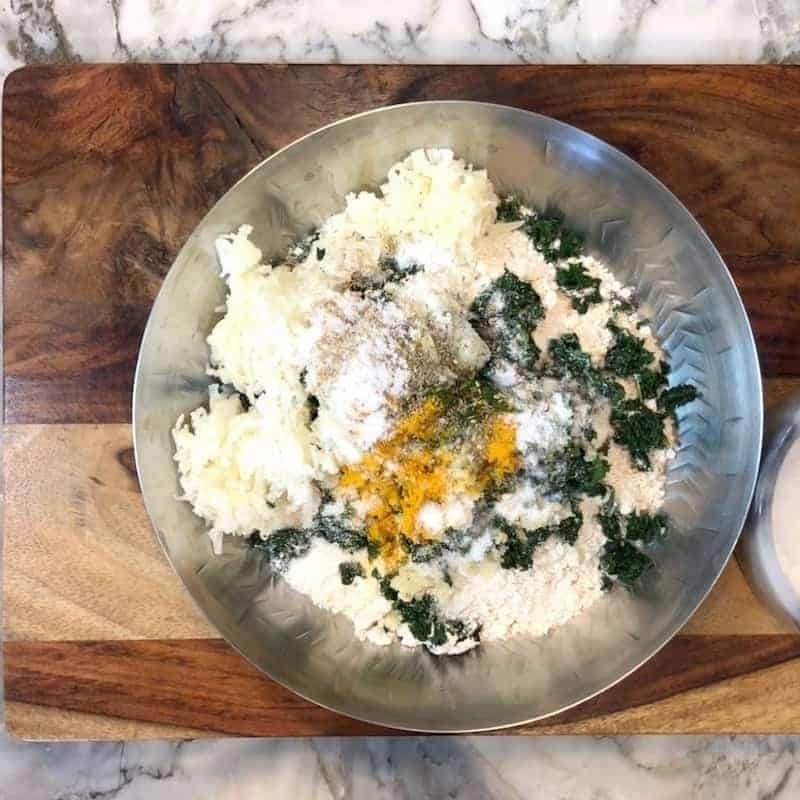 In a big mixing bowl, add whole wheat flour, chopped kale, potatoes, minced garlic, minced green chilies, sesame seeds, carom seeds, turmeric and salt. Mix well so all the moisture from the veggies gets evenly distributed with the rest of the ingredients. Using little bit of water as needed, knead to form a smooth dough. 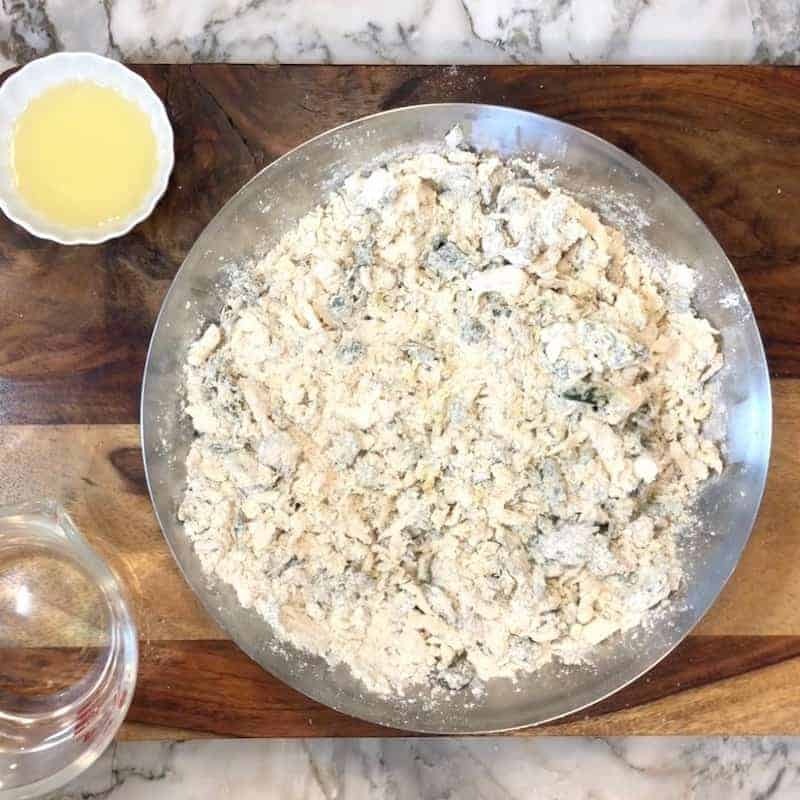 Add oil to the dough and knead it for few more minutes until the dough becomes more smooth. Let the dough rest for 20 to 30 minutes. 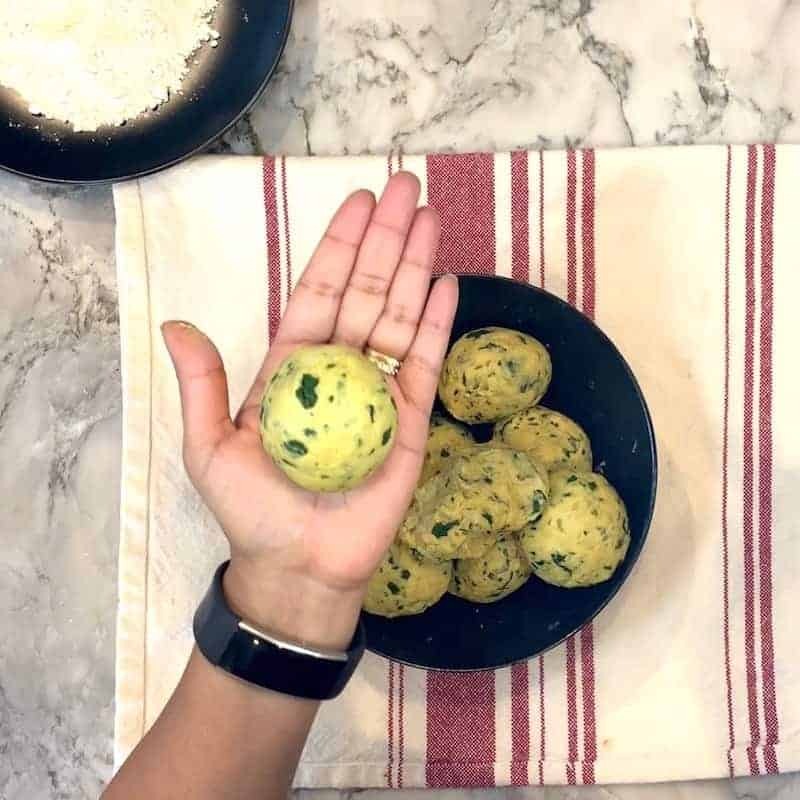 Divide the dough into 8-10 tennis ball sized, round balls. 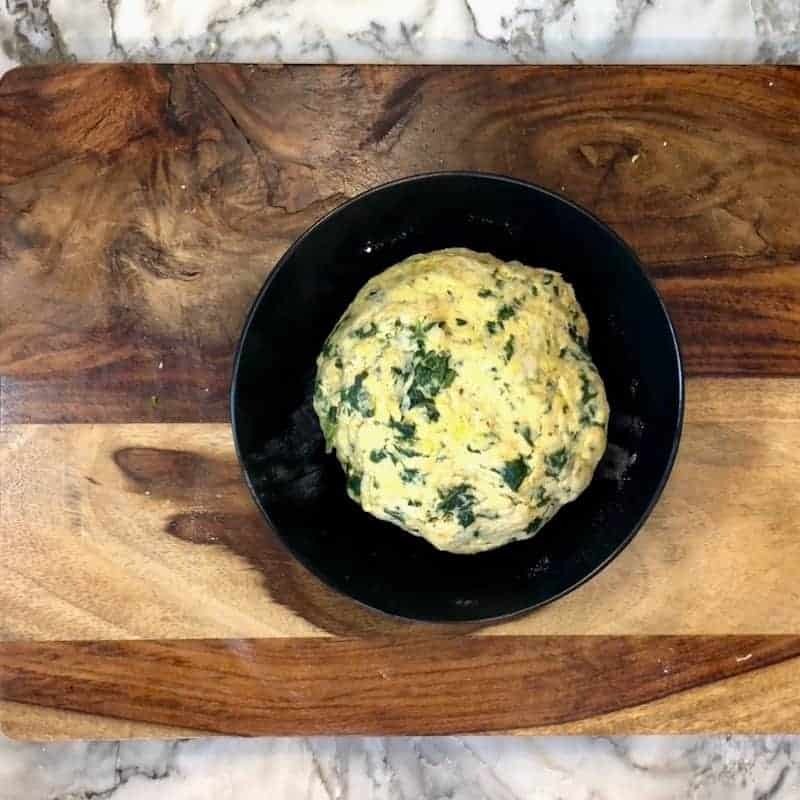 Coat the dough ball with dry flour and roll it using a rolling pin into 6-8 inches round circle. Heat a non stick griddle or pan on medium-high flame. 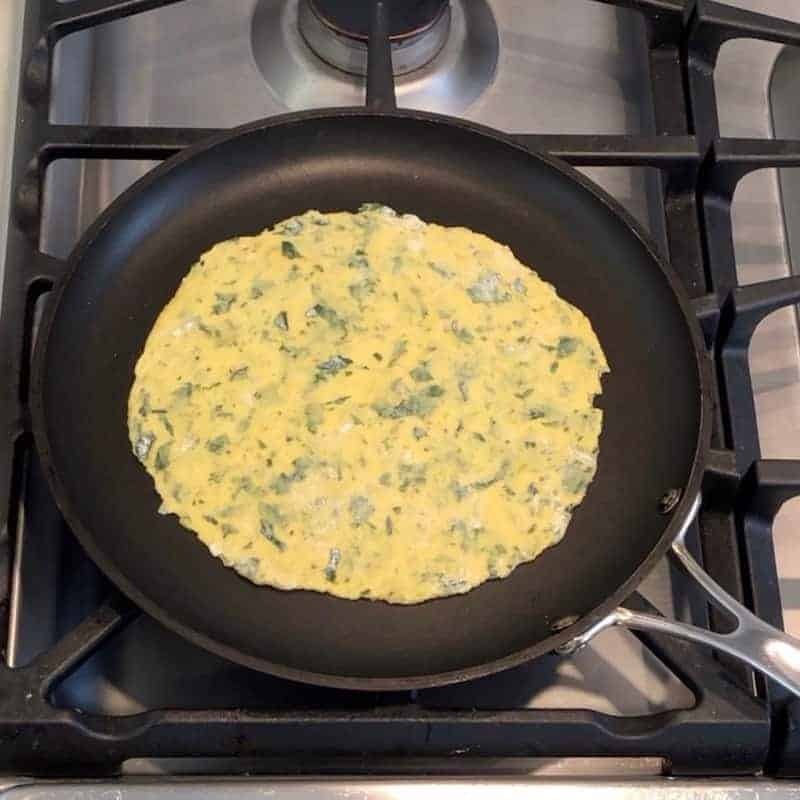 Carefully place the rolled paratha on the hot pan. Cook for a minute or less and then flip over. Cook the second side until it starts to get light brown spots. Apply some oil or ghee to the top of the paratha and flip over. Apply oil or ghee to the side that is now on top and cook until both sides get light brown spots on both sides. Gently press with a spatula to evenly cook the paratha. 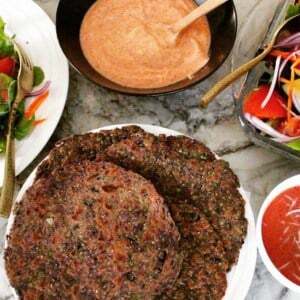 Serve hot kale potato parathas with chutney, pickle or a dollop of yogurt! 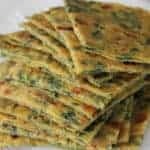 Layered flatbreads made with whole wheat flour, blanched kale, potatoes, green chilies, garlic and spices. 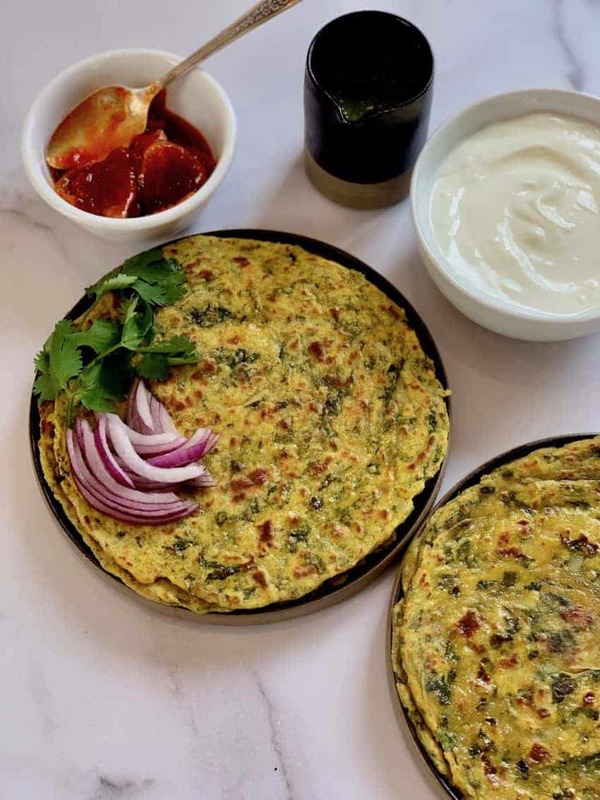 Serve hot parathas with chutney, pickle or a dollop of yogurt! Oh my the paratha’s look amazing. Love flatbreads. 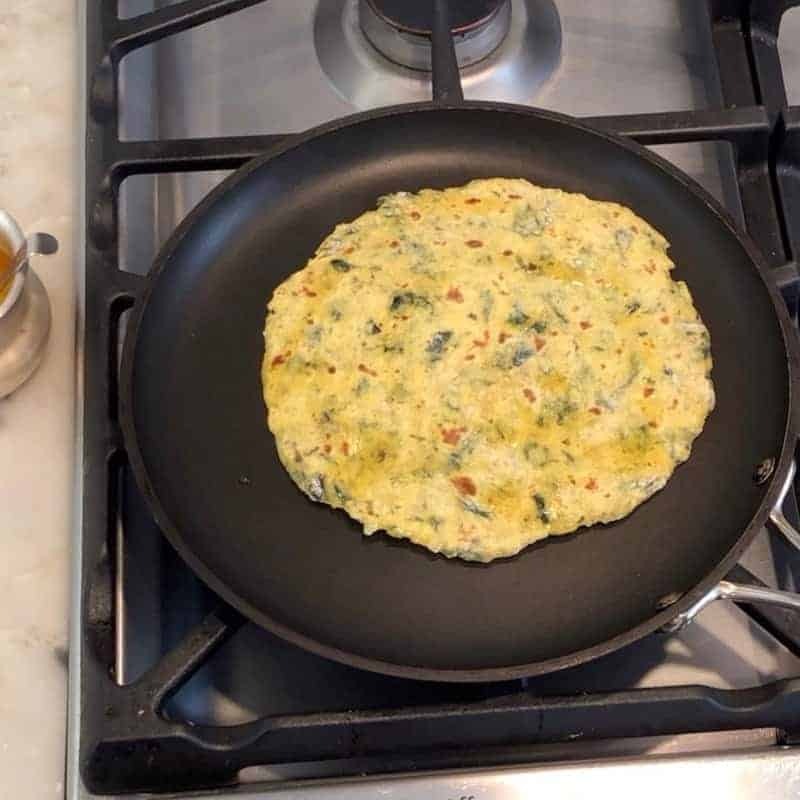 Wow so good archana.. Love this paratha out of kale. Great way to sneak it and get acquired too..
Prathas are going global. 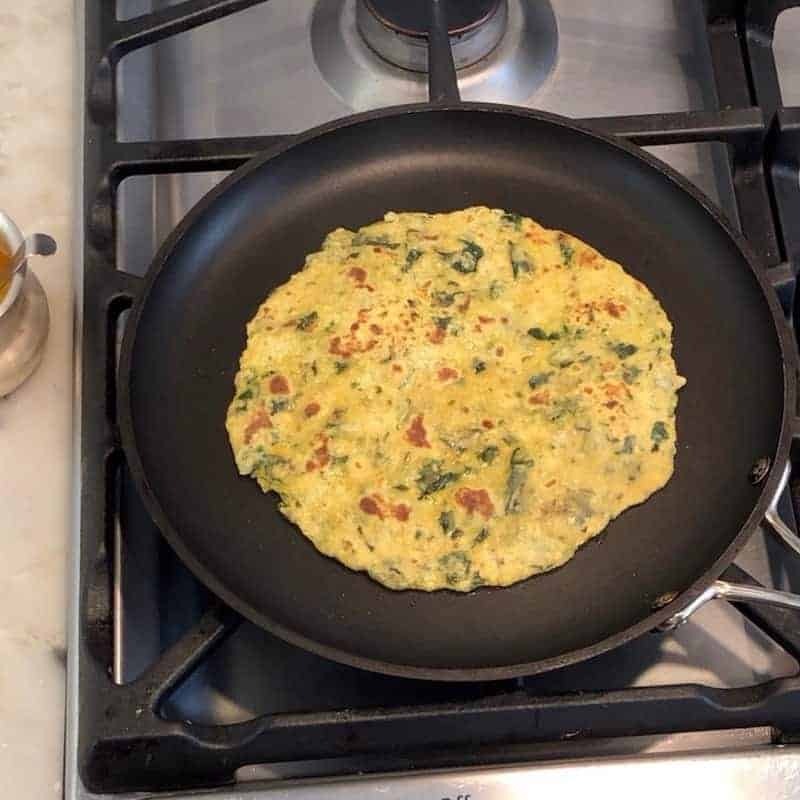 I saw many Australian chefs making aaloo ka parantha, then layering it with vegetables, and ate just like a Pizza. I have to admit I tried that and it got nod from everyone. :). the layers on your yummy parathas are so beautiful. Thank you for your kind words Mann. We love parathas! Delicious, healthy and yum comes to mind…. Hi Archana. 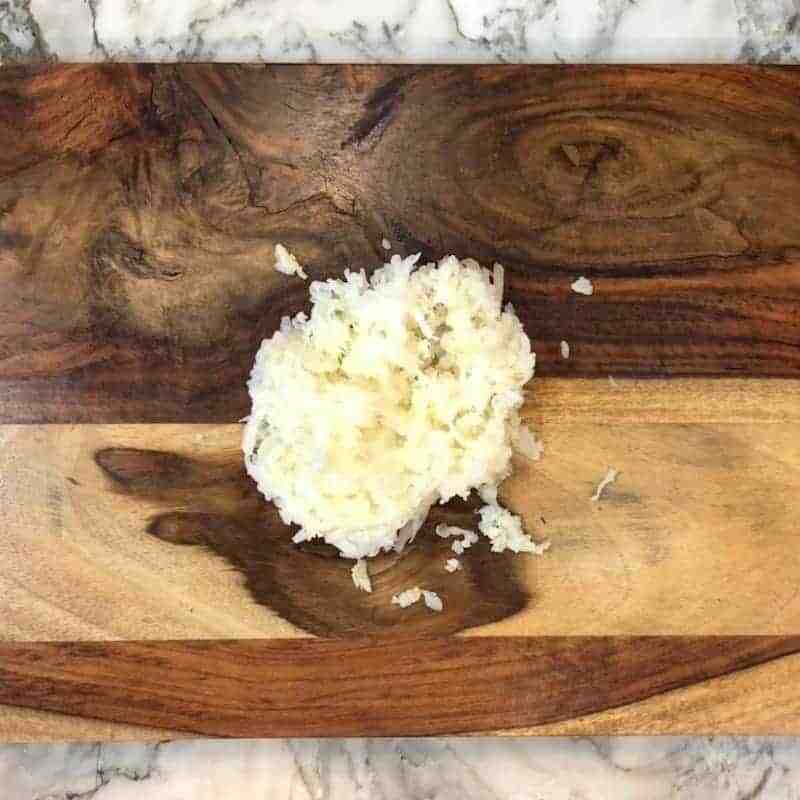 It looks like a wonderful recipe. 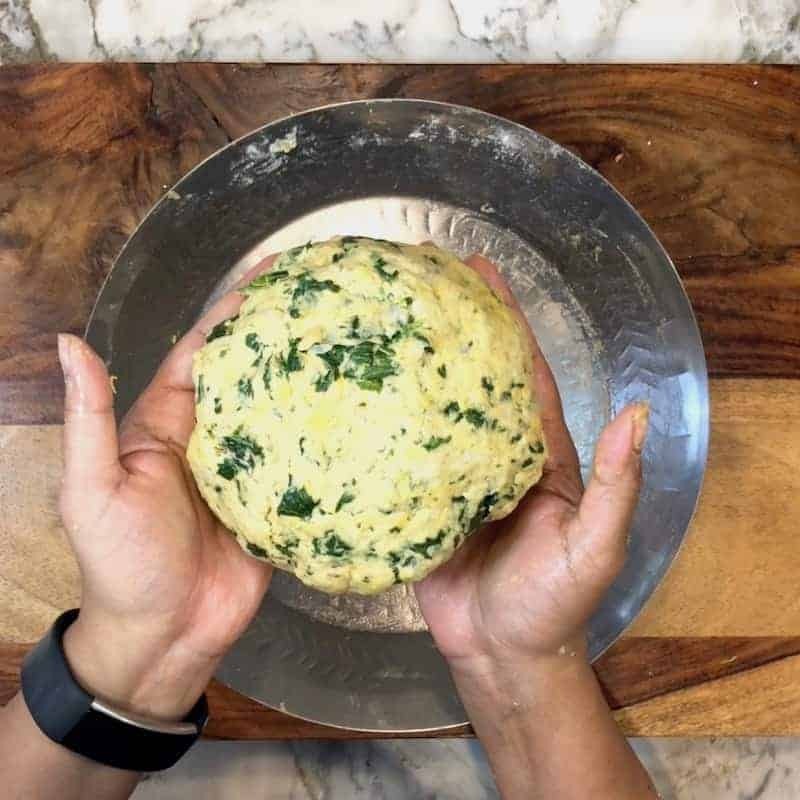 Can you freeze parathas or should you freeze the dough? Hi Ellie, you can freeze the parathas. So good and a unique combination! Thank you Nancy! they are super healthy and delicious. 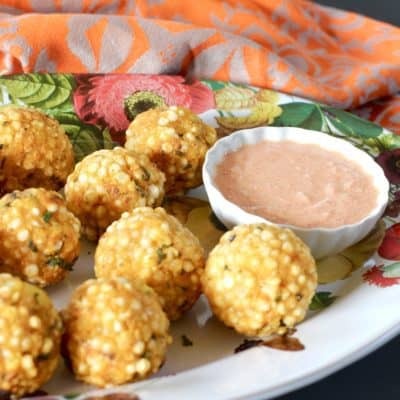 I am from Goa a place in India, and this is a very good recipe! thank you for posting it!